English ivy (Hedera helix) is a shade-tolerant, woody perennial vine. When established it creates a dense ground cover with attractive dark green foliage. But, left un-checked this introduced plant invades woodlands, climbs (and kills) trees and is considered an invasive species. Pursuing the internet you can find several “recommendations” for controlling English Ivy. Some good, some are questionable. Culturally, this plant is difficult to control. English ivy can be controlled with mowing. But the mowing must be frequent (like mowing a lawn) and you must mow the entire infestation to “starve-out” the plants. Pull it up. There are several on-line videos demonstrating how to “roll up” the English ivy vines. Cutting the vines into sections, and then cutting the vines where attached to the roots. This will be a very labor-intensive effort. But, if you put enough effort and hours into it, most any weed can be removed by hand. Many vines will grow back from the roots, so return to the site regularly to remove re-growth. Remove it from the trees. English ivy in trees can be killed by cutting the stems at the ground and removing the vines from the tree as high as you can easily reach. The remaining vines in the tree will die and eventually fall off. Again, if you look on-line, there are many reports and recommendations – some good, some not so good. One of the most commonly recommended herbicide treatments is triclopyr. But, in my experience triclopyr is less effective than glyphosate. What does the research show? 1. Timing makes a difference. For best results, apply glyphosate in the spring when English ivy has 2 to 4 new leaves. Retreat about 6 weeks later if you see re-growth. English ivy becomes less and less susceptible to glyphosate as the season progresses. Control in mid summer can be improved by mowing the ivy, then spraying the regrowth. English ivy new growth. The best time to apply glyphosate for control. 2. The formulation does matter. All our research was done with the Roundup brand formulations. Even within the Roundup family of products, we saw differences in control. You will likely get poorer control with “generic” formulations. Also, DO NOT USE the fast acting formulations. Weed control will be poorer if you burn the leaves off before the herbicide can move to the stems and roots. Diluted, ready-to-use formulations will be less effective. Purchase a formulation that is >41% active ingredient and dilute it for treatment (see dosing guideline below). 3. There is a clear dose response. Glyphosate applied at 4 lb/A is much better than glyphosate applied at 2 lb /A. See photos below from our 2009 experiment. If you want to kill English ivy, use the full labeled rate of glyphosate. For the common 41% active ingredient formulation, I recommend a 4% solution by volume (that’s 5.1 ounces of herbicide in one gallon of spray mix). 4. Options other than glyphosate? 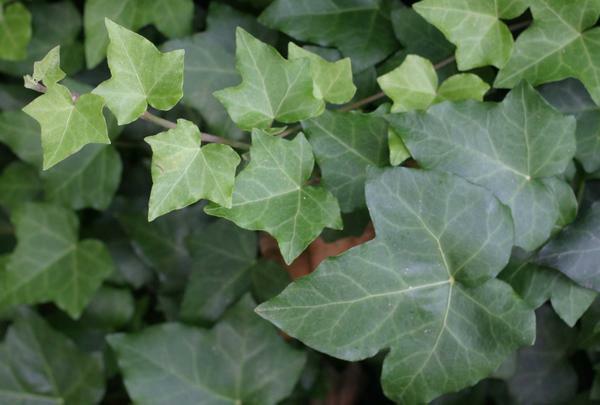 Several herbicides will damage English ivy but most are not as effective as glyphosate. Dr. Jeff Derr of Virginia Tech reported two applications of 2,4-D amine at 1 lbai/A to actively growing English ivy provided complete control. Dr. Derr also observed that triclopyr was less effective compared to glyphosate or 2,4-D. Regardless of the control method chosen, this is a woody perennial vine that can return from small stem segments. It is also spread by seed. So, return to the site frequently to remove any newly emerged ivy plants. With persistence you can get rid of this pesky weed.